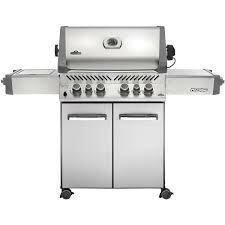 The Napoleon Prestige PRO500RSIBNSS-1 500 Stainless Steel Natural Gas Grill has a massive 500 square inch primary grilling area, large enough for 30 burgers. Built with high-performance and high-quality craftsmanship to out-style the competition. Who says a grill can’t look great and perform even better? From the very bottom of the locking casters that make the grill easy to move to the sleek storage shelves with interior lights, up to control knobs with Night Light technology, and the over-the-top halogen lights inside the grill for those starry-night backyard barbecues, so you can see what you’re cooking. The Napoleon Prestige Pro 500 must have been designed with late night grilling in mind, as there are lights everywhere to help you find everything you need to prepare food like a Pro. And, everything is encased in stainless-steel for rugged durability season after season. On the side shelf, Napoleon placed the swank Sizzle Zone infrared side burner, which will give you over 3000 °F searing fire (hot enough to melt glass) so you can leave your grill marks on those perfectly seared steaks. The Sizzle Zone forces gas through thousands of little portholes poked into a piece of ceramic. The Sizzle Zone gives you the ability to sear a steak with the same quality as even the best steak houses but in the cozy nook of your backyard. Now, the rear burner is unique in that it is an infrared system that assists the rotisserie when in use and keeps the roasts juicy and browns them perfectly. There’s plenty of storage space under the grill for everything you need to cook and don’t worry about finding what you need after dark as there is lighting in the storage area too. Napoleon thought of everything with the Prestige Pro 500, including a cutting board and marinade bucket on the extensive side shelves, lit storage shelves, towel holders, and even a bottle opener. With the Napoleon Prestige Pro 500 Natural Gas Grill you have 500 square inches of primary cooking space and 9.5 mm WAVE cooking grids with very little space in between so your food won’t wind up on the burners. Its reliability, styling, and performance are unmatched by other gas grills in this price range. Since this is a new grill, we found only 9 customer reviews on Amazon with an average rating of 3.6 stars out of a possible 5 stars. However, to give you a better idea of what customers thought of the Prestige Pro 500, we looked at other retailers and gathered statistics for similarly priced and equipped Napoleon Pro 500 grills. Out of the 63 customer reviews we found, 52 customers or about 80 percent rated the Prestige Pro 500 either 4 or 5 stars and only one rated it with 1 star because the customer was unhappy with the home service assembly they received. In summary, this grill is the Cadillac of gas grills and some would say it is priced to match, but worth every penny because you will probably never need another grill. An amazing grill with amazing and durable features, built to last!